When learning how to groom your horse, knowing how to approach and care for his face, mane and tail is important. You'll learn how to do this in this third step of a four part tutorial. If you just landed here, I recommend you go back to the beginning so you can review things in order so it will make more sense. Although if they are handled properly, the horse should not have an issue with having his head cared for, not all horses have had the proper training or some have been mishandled. 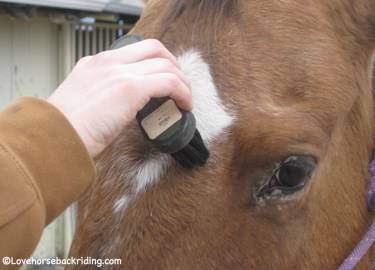 It is up to you to use great care when you groom the horse's face. Because they can be sensitive here, I recommended you start on the neck and work your way back, doing the rest of the body first. This gives more time to get to know you before you approach their head with grooming tools. 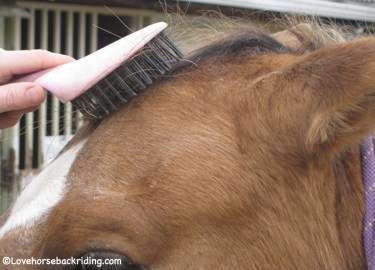 You should only use soft rubber curry combs and brushes to groom this area, as it can be sensitive. Care should be taken not to hit the eyes, and only to use the softest of brushes on the ears. Use the same strokes you learned to groom in the prior pages, but much softer. Move slowly around his face. If the horse doesn't like something, back away from it and then re-approach the area slowly, only doing what he can comfortably tolerate. You can also use a damp rag or sponge to clean gunk up from the corners of the eyes, the insides of the nostrils, and the ears if needed. To groom this hair, you will want to use a brush like the one above that is made just for the mane and tail, or a flat mane comb. Start at the bottom of the forelock and mane and work your way up until you reach the neck. This allows you to gently work out any tangles and knots without damaging the hair. Do NOT cut the mane or forelock with scissors. This leaves it looking very unnatural. 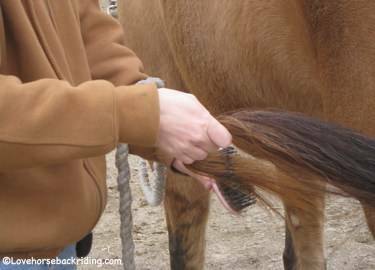 When learning how to groom your horse, start by standing off to the side as pictured above when grooming the tail, especially if you don't know him very well. Start at the bottom, and work your way up slowly, gently untangling any knots. If he has a very thick or long tail, you'll want to take small sections at a time and use the same approach. Now you are ready to pick out the hooves. Get rearing on over from how to groom your horse back to the home page where you can learn everything from anatomy to riding skills.